The pike fishing on spinning in November associated with aggravating search fish than the colder becomes the water, the farther from the shores to depths pike. The predator is in full swing preparing for the winter. Cooling water is forcing peaceful fish followed by the predators to leave coastal waters. The predator holds certain places and leaving them very rare. 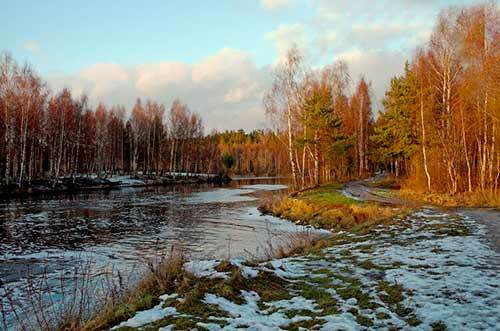 Good for pike is predsedateley period, when the frost has already come and ice yet. At this time, the pike bite spinning can be quite active. The short-term period and depends on the size of the reservoir. At low water the tide is 1-2 days, the reservoirs 3 to 5 days, in large rivers – a week or more. the depth of one metre (rarely). A huge role in successful fishing is the choice of the reservoir. Starting to catch on spinning in November on small rivers and lakes, then comes the turn of medium-sized reservoirs. In the last turn pass to catch for a long time not freezing large reservoirs and rivers where pike adheres to the depths more than 5 meters. In November, pike no need to look for food – food is going in the same wintering pits, where there is a carnivore, so finding a predator once, you can be sure that he will be there next. November is a harbinger of winter. In many regions this month, when bodies of water is established ice. The behavior of pike in that month is determined by weather conditions and time of day. The best weather for fishing is consistently cloudy with no strong winds and pressure differences. In November, in contrast to summer, there are days when a sharp jump upward pressure with the simultaneous arrival of the anticyclone, produce active pike bite spinning. 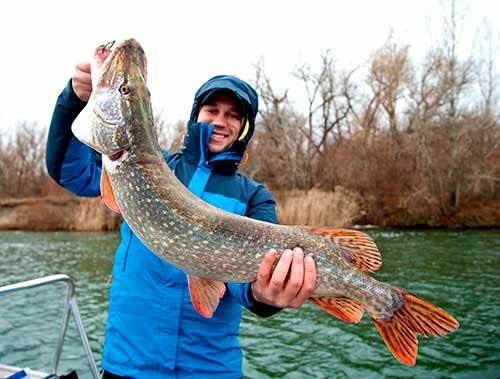 In most cases, the best time for pike on spinning in November, early morning and late evening. However, there are no rules without exceptions, for unexplained reasons, is the active bite in the middle of the day, especially for small reservoirs. For pike spinning at depths used big lures and heavy sinkers, and therefore all components of the equipment should be appropriate. 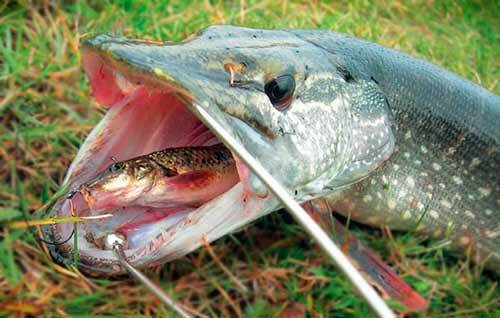 In turn, the pike, on the average, in November, catches are much larger than in the early autumn and summer. The best option spinning rods for autumn pike will be medium or medium-fast action. The average system used with a braided line, and medium-fast with monofilament. In this case, fishing line or rod will be to extinguish the jerks fish. Test of the rod depends on the weight of used baits. In small ponds enough dough to 20 g, and at great depths of large rivers and lakes may be small and test in 30 g. When selecting the test rod is necessary to consider that in November, used large bait, which themselves are not light weight. Shore fishing with spinning used fishing rods with length from 2.7 m to the boat fishing length of 2.2 m.
For catching of a large pike on spinning the best option is a spinning reel of average class size from 3000. For large weights of lures is desirable at least 5 bearings, which are able to protect the coil from rapid destruction. It is possible to use the dual coil, but it is much more expensive and has only one advantage over the instantaneous – able to operate without damage with large weights. In the transparent cold water line should be less visible. For pike is used as a monofilament fishing line and braided. For fishing with the use of the jig and drop the leash fits better with the braided line – it is more sensitive when tapping the bottom. Diameter monofilament fishing line 0,25-0,3 mm, braided – 0,12-0,14 mm. Leashes are used soft of tungsten. Clasps on leashes – a small but durable. For discharge of the leash is perfect flurocarbon fishing line 0.3-0.4 mm. Preference should be given to the lures of at least 8 cm in November, pike prefers to catch one big fish instead of chasing several small ones. The best lures for pike in November on spinning are a vibrating medium and large size.Excellent work at great depths such as spinners kastmaster. Good results shows the good old “Atom” and the spinners Williams and KuusamoProfessor. Most often, bites occur on spinner silver color or mixture of colors with “silver”. We must not forget that in addition to their movement, the spinner attracts the pike acoustic waves. Good option for dual ringing spoons. 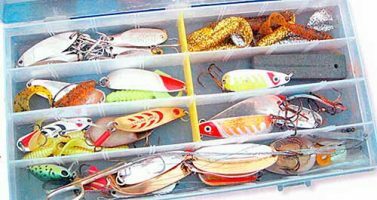 Most often in November used a sinking or neutral lures. For fishing at depths of 5-6 m, are “Minou” with a working depth greater than a meter. For sure the immersion and give the ability to work from the bottom, the Wobbler is loaded “Cheburashka”, and the wiring step is applied. There are occasions when a great work surface lures. The best Wobbler among them, Duel 3D Popper. A good option for fishing at depth Rapala Husky Jerk. Used for trolling the large lures – from 12 cm and jambeity. The main requirement is a large penetration. Almost all bite in late autumn occur at the bottom. Silicone lure for spinning in November, especially if the first frost, often lose their effectiveness on small rivers and lakes. Bite on “rubber” continues on the major rivers, lakes and reservoirs, especially at great depths. In such reservoirs a large jig – lure No. 1.Also for the November hunting for pike use a foam fish and Mandola. Color of lure can have a decisive role. Very often it is the brightest color – “kislotnik”. Good bait on the spinning rod in November working live bait or dead fish. 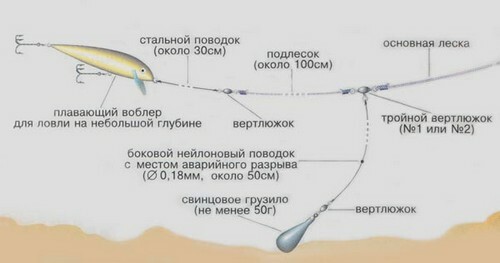 To use this bait uses different snastochki discharge on a leash. Work best snastochki based on two hooks-doubles. Fish such snastochki stand up to a dozen casts. Spinners in November for fishing spinning practically applied. With each new fishing anglers have accumulated our own experience of fishing on the waters of a certain type and in certain conditions. at the November fishing should not neglect their own health – the clothing should be warm, not waterproof and comfortable. To fish for pike in November on spinning is not only possible, but necessary. Such fishing requires some change psychology a fishing and careful preparation. Instead, she brings trophy fish pike and most importantly positive emotions.